« What Planet is This? A snip of cable cutters by government officials opened the last gated barrier to the 26-mile South Bay Trail, followed by a flood of cyclists and hikers pouring through at noon on Monday, September 20. John Bourgeois, Exec. Project Manager, South Bay Salt Pond Restoration Project, introduced Congresswoman Anna Eshoo (14th District) to open the ceremony as hundreds looked on next to the revitalized Bay on one side and NASA Ames/Moffett Field on the other. She thanked the many public agencies, volunteers, and Cargill salt for their efforts. Even Eshoo expressed relief after more than two decades of wrangling over restoring the bay and opening the final trail segment. Cargill donated 16 acres to make the 2.4-mile trail and nearby salt pond turned bay restoration a reality. Cargill initiated the donation six years ago and worked with the San Francisco Bay Trail Project, the U.S. Fish and Wildlife Services, the NASA Ames Research Center, the 129th Air Rescue Wing of the California Air National Guard, the State Coastal Conservancy, cities of Mountain View and Sunnyvale, and Lockheed Martin to connect the trail. Representatives of all these agencies turned out under beautiful sunny skies and a nice breeze as white pelicans bobbed in the restored bay. What’s not so obvious is that much of this area was once a giant salt pond. The South Bay Salt Pond Restoration project is the largest on the West Coast, encompassing some 15,000 acres. Julia Miller, San Francisco Bay Trail Board of Directors and former Sunnyvale mayor, showed where more bay restorations will soon take place in and around Alviso and near the eastern end of the San Mateo Bridge. I joined the riders, including former Palo Alto City Councilwoman Ellen Fletcher, on the ride to Mountain View’s Shoreline Park. I can’t say much for the trail itself. Some gravel was thrown down here and there, but that’s it. There is a nice observation scope for public use midway along the levee. While the levee is not ideal for bike commuters, it is a great way to see migrating ducks in the fall. The bay restoration is what’s most encouraging as it improves wildlife habitats. I’ll be back to check out the ducks this fall. 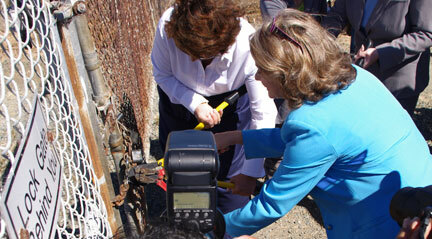 Anna Eshoo and Julia Miller cut the chain lock to open the Bay Trail. This entry was posted on September 20, 2010 at 9:57 pm and is filed under News, Ride reports. You can follow any responses to this entry through the RSS 2.0 feed. You can leave a response, or trackback from your own site. Looking at the picture, it looks like a trail for mountain bikes and hybrids. Is any of it paved for road bikes? The section opened is all dirt. Gravel was added because if you don’t, it becomes a muddy mess when wet. I rode on 28 mm tires. Not an issue. The paved South Bay areas are Shoreline Park, Coyote Creek at McCarthy Ranch, parts of Palo Alto, Dumbarton Bridge, a section along 237 at Twin Creek Sports Complex. Levees, unless reinforced, do not handle pavement well. Things start cracking, as evidenced along portions of Shoreline Park. I rode it later in the day on 28 mm tires. As Ray said, it’s not an issue; the surface is fine for 28 mm or wider tires. P.S. This is a fantastic achievement. It’s that last connecting trail we needed.